Pin nailers are extremely useful power tools that are somewhat similar to brad nailers. The best 23 gauge pin nailers are much more accurate, using a small, 23 gauge pin for fastening material. While there are electric pin nailers powered models, pneumatic pin nailers are generally better when it comes to ergonomics and are used by many professionals in their work. Our top pick for the best 23 gauge pin nailer is the BOSTITCH HP118K 23-Gauge Pin Nailer. It has a number of useful features, including his low-profile and adjustable depth control. It can accommodate pin nails as big as 1-3/16 inch, which is more than adequate. It also offers durable, aluminium construction and is highly versatile. When you have to do discreet nailing on your woodworking projects, a high quality pin nailer might be exactly what you need. If you’re looking for the best 23 gauge pin nailer on the market, the following five 23 gauge pin nailer reviews will help you narrow down your search. Fastener Length: 1/2" to 1-3/16"
Its heavy duty aluminium construction means that it is highly durable and lightweight. This versatile pin nailer should provide you with years of efficient use. This model can accommodate pins ranging from ½ inch to 1-3/16 inch in length and also has an adjustable depth control. This means it is very versatile. One of the best things about this particular unit is that it has a low-profile form factor, allowing it to easily be used in small, tight spots. In addition, it has a control for adjusting the depth, which simplifies working with different types of materials. Another great feature of this pin nailer is that the magazine holds 200 pins, meaning you can get a lot of work done between reloads. Plus, there is an easy-to-use lever for quickly removing the magazine and replacing it. The units tapered nose allows you to more easily see what you’re nailing, increasing accuracy. The handle is rubber coated and ergonomically designed or comfort and ease of use. You can use this tool for hours without experiencing a lot of fatigue. Fastener Length: 5/8" to 1-3/8"
This pin nailer is powerful, versatile still very affordable. It can be used for any number of tasks and will be delivered to you with a carrying case and safety goggles. The magazine automatically accommodates standard pin sizes, ranging from 5/8 inch to 1 3/8 inch. This range of pin sizes is one of the reasons this particular model is suitable for many different nailing applications. You’ll also get more precise nailing and greater safety thanks to the dual trigger feature. The Hitachi NP35A also features a no-mar nose that allows you to work in tight areas without damaging the material you’re working on. This model does come with a depth adjustment function, allowing you to work on materials of different thicknesses without having to adjust the compressor PSI. This function is simple and can be quickly adjusted in seconds. You’ll even get an indicator that lets you know when you need to reload, while the convenient rear exhaust ensures that any oil or particulates don’t get on the user. At only 2.2 pounds, this Porter-Cable offers you rugged durability with its aluminium construction. This tool is great for furniture makers, cabinet makers and more, providing a convenient belt clip so that the tool can travel with the worker without being carried by hand. Excellent for affixing trim and other small details, as well as wood joining and mantle building. Its smaller size means less likely to split materials than larger tools might. It also has a lockout mechanism that prevents firing when there are no remaining nails in the magazine, as well as a low nail indicator. It automatically adjusts to different nail lengths, which speeds up your workflow. This tool can handle 23 gauge pin nails ranging from 5/8-inch to 1-3/8-inch. The rear mounted exhaust ensures that any contaminants or moisture travel away from the material you’re working on, while the removable no-mar tip prevents wood indentations. The Freeman PP13823 is just what you need for fastening trim, assembling picture frames and other similar hobby activities. This model features and easy to load magazine that can handle pin nails ranging in length from 5/8 inch to 1-3/8 inch, while the no mar tip and small nose mean you can reach tight spots without damaging the surface. The ergonomic handle and construction make this tool easy to use. It’s also made out of diecast aluminium, ensuring that it’s both lightweight and highly durable. This pin nailer also includes a handy exhaust that is fully 360° adjustable to ensure that you can keep oil and contaminants away from you while you’re working. There is also an indispensable safety trigger feature to prevent accidental firings. This particular model is designed for professionals but will be equally useful for do-it-yourselfers thanks to its light weight. Fastener Length: 1/2" to 1"
This particular pin nailer is a quite affordable model that has features and specs that are competitive with much pricier models. It is provided as part of a kit, meaning that it comes with pin nails when you purchase it. While the magazine capacity is not as great as some, the 170 in nails it can handle is adequate for most purposes. It can automatically adapt to different fastener sizes, allowing you to work faster when you’re changing out pin nails. This model handles pin nails ranging from ½ inch to 1 inch, which means it can’t handle some of the longer nails professionals might need. In fact, among all of these reviews, this one has the smallest fastener size. This means that it works well only on fairly thin materials. It does come with rubber coated handles that make for easy use and an indicator letting you know when the nails are low. While on the surface, they might seem like brad nailers – and certainly they will very much like – there are in fact significant differences in how they are used and what they are used for. Pin nailers are particularly useful for trim work in situations where you don’t want the nail to be visible. Something similar to 15 gauge finish Nailers. In other words, if you’re putting trim up in a room that you don’t want to mar with lots of exposed nails but also don’t want to cover with paint, a pin nailer is the ideal power tools for this job. In the same way, if you’re doing cabinet or craftwork, you probably won’t want the nails to show either. As the name suggests, it shoots thin 23-gauge nails also referred to by many woodworkers as pins. They leave almost no holes on your wood surface. Nobody likes filling nail holes after finishing a stool, a coffee table or any other woodwork project. Most pin nailers can take between 1/2" - 1-3/8"" long nails. The extremely thin, headless pins these tools use will drive deep down into the material so that they are virtually invisible unless someone looks very closely at the surface. This makes them ideal for trim work. This is one way they differ from brad nailers, which still have visible heads. So clearly, pin nailers are best for delicate materials where the affixing needs to be as discreet and unseen as possible. When you are choosing a pin nailer, you will want to have one that can accommodate a wide range of pin lengths. At the very least, you will want your pin nailer to be able to handle down to ½ inch and up to 1 inch. The best 23 gauge pin nailer would be one that can also handle 3/8 inch to 1-1/2 inches. You also need to think about the capacity of the magazine in your pin nailer, since you don’t want to have to constantly be reloading. In a good quality pin nailer, the magazine should hold a minimum of 100 pins. It’s also a good idea to buy a nailer that has a status indicator so you’ll know it the magazine is getting low. Every time you fire a pin nailer, it’s going to expel oil and air out of its exhaust. For this reason, you’ll want to buy a pin nailer that has an adjustable exhaust that can be pointed away from you while you’re using the tool. In all likelihood, you’ll find yourself in your woodworking using different kinds of materials of varying densities and thickness. Therefore, it is very handy to have a pin nailer that includes depth control. Otherwise, you will find yourself forced to adjust the pressure on your air compressor every time you change to a different material, which is inconvenient and interferes with work. One other thing you want to be sure about with your new pin nailer is that it is made by a reputable manufacturer and solidly built. After all, you want to get your money’s worth out of it, so it needs to last you many years. In addition to durability, make sure the manufacturer provides at least a one year warranty. There are two major types of pin nailers – pneumatic and electric pin nailers. This type of pin nailers fire nails with the use of compressed air delivered by an air compressor. Your pin nailer will work as long as you want so far your air compressor is working. Pneumatic Pin Nailers are cheaper than electric ones. However, you should also consider the cost of an air compressor and general cost of maintenance. They are lighter than electric ones and can be the best option for you if you already have an air compressor. Pin nailers are useful in joining delicate trim pieces of wood or veneers and also when working on small and medium size furniture trim. Gluing and clamping large pieces of wood together accurately could be a daunting task sometimes as the pieces tend to slide. This can be solved with a pin nailer. A couple of shots will prevent any side movement of the wood pieces. Pin nailers don’t come with safety retractable nose, instead, most pin nailers use a dual trigger arrangement to prevent accidental misfiring. Pressing the trigger the first time engages the tool while the second time actually fires the nail. Although a pin nail is very small, you’ll be surprised about the extent of injury it can cause to the body if not used properly. There are thousands of injury cases every year caused by nail guns most especially to the hand, fingers, and legs. Below are some tips to follow in order to be protected from the hazards of nail guns. Wear safety goggles, ear protection, and hand gloves during maintenance. You may also need to wear a dust mask if your work area is dusty. If you have a pneumatic nail gun, always disconnect air supply when servicing the tool or moving entirely to another work area. Pin nailers are the only class of nail guns that don’t come with safety engagement, so don’t point the tool at yourself or towards others. Make sure you’re in a good physical condition before operating your pin nailer. Don’t operate the tool when fatigued or under the inﬂuence of drugs which might affect your sense of judgment. Lubricate your pin nailer with a few drops of air tool oil applied to its moving parts before use. Do this from time to time throughout your session if you’re going to be using your pin nailer all day. Heavy vibration tends to loosen some screws and bolts after extended use. Tighten any screws or bolts on your pin nailer at least once a month and replace damaged parts immediately. You don’t want a screw or bolt coming off while operating the tool. If you’re using a pneumatic pin nailer, you need to clean the feed system daily by using a can of compressed air or an electric blower duster to blow out any dirt that may be stuck inside the feed system. 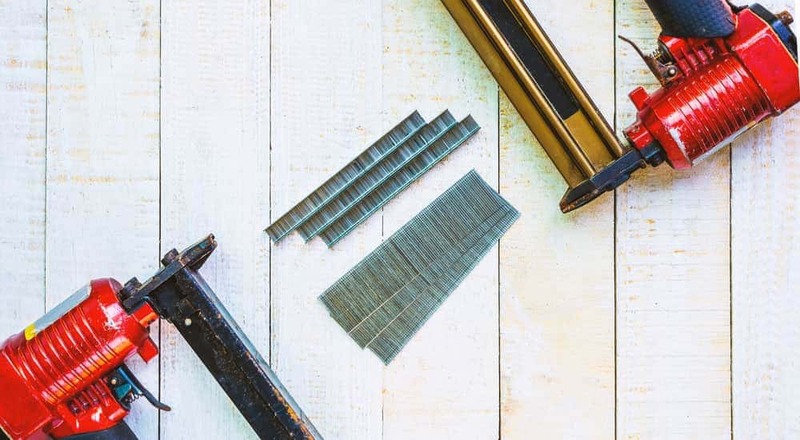 Although some pin nailers come with a feature that lets you know when your nails are almost finished, always check your nail clip periodically and replace nails when necessary. Use complete safety gear when operating a pin nailer and ensure you’re within a safe working environment. Use a pin nailer only on light wood trims, using it on thicker boards will not hold them in place. A: Use a 23-gauge pin nailer when working on delicate trim pieces of wood such as base and casing, bead board or wainscoting, board, and batten. Pin nails provide almost no holding power, so it is essential to use them with adhesives. They can be used in holding the pieces of wood together while the adhesive dries. They are easy to pull out after using them for this purpose. A: No, A pin nailer is not capable of doing heavy wood tasks such as installation of baseboards or other heavy wood trims. The highest a pin nailer can take is a 2" nail, a more suitable tool for heavy-duty wood tasks such as those is an electric cordless framing nailer or some high-end brad nailers. A: When installing a quarter round, the size of your nail should be as small as possible leaving only a small hole to fill. However, you also need a nail long enough to hold them in place. Brad nails are the most suitable nails for this task but a pin nail would be nice if you can manage to hold the quarter round in place. A: Pin nailers can be used for light trim wood pieces, tiny furniture trim, and in other cases where larger nails will damage the wood. A: Yes, you probably don’t want large nail holes to be showing on your picture frame. Using a pin nailer gives you a very fine transition between the nail and the frame. Your visitor might not even notice the nail unless you intentionally show it to them. Our pick for the best 23 gauge pin nailer is the BOSTITCH HP118K 23-Gauge Pin Nailer. It has a number of useful features, including his low-profile and adjustable depth control. It can accommodate pin nails as big as 1-3/16 inch, which is more than adequate. It offers durable, aluminium construction and is highly versatile. The low-profile form factor means that you can more easily get your pin nails exactly where you want them – even in particularly tight spaces. It has a double trigger safety feature, is ergonomically designed and even comes with its own carrying case. While it’s not out front in every category, this 23 gauge pin air nailer still offers real value for your money.